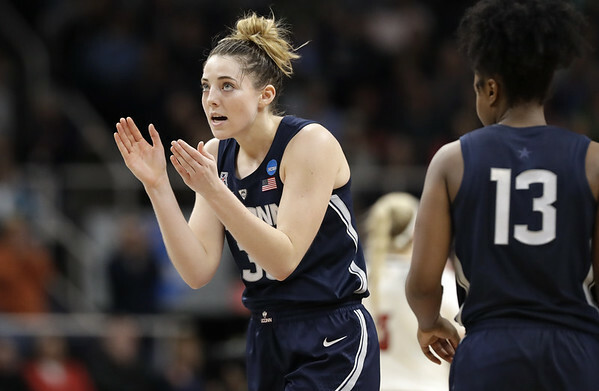 ALBANY, N.Y. - Katie Lou Samuelson put UConn on her injured back and shot the Huskies into a record 12th straight Final Four. Samuelson scored 29 points and second-seeded UConn held off No. 1 Louisville 80-73 on Sunday in the Albany Regional Final. The Huskies (35-2) have won six national championships and had a 111-game winning streak during their remarkable Final Four run. They will be looking to try and reach the title game for the first time in three years after they have lost on last-second shots in the past two national semifinals. Samuelson hit seven of the team’s 14 3-pointers, including many big shots in the fourth quarter. UConn needed every one of them as the team nearly blew an 11-point lead in the final 1:47 of the game. Louisville scored 10 of 11 points to cut its deficit to 75-73 with 26.6 seconds left. Samuelson then hit two free throws to make it a two-possession game. Asia Durr was fouled a few seconds later, but the Cardinals’ senior leader missed both free throws. Napheesa Collier was fouled after the Cardinals’ missed a chance on an offensive rebound. She stepped up and sank both free throws on the other end to make it 79-73. As the buzzer sounded, the Huskies all mobbed Samuelson at the foul line celebrating another trip to the Final Four. Louisville (32-4) was looking to become only the second team to beat UConn twice in a season in the past decade, joining fellow ACC school Notre Dame, which did it in 2012 and 2013. The Huskies could face the Irish in the Final Four in Tampa if Notre Dame beats Stanford in the Chicago Regional final on Monday night. UConn was not a No. 1 seed for the first time since 2006. While much was made of that leading up to this game, the only real differences as coach Geno Auriemma put it was that his team would wear the road blues and would be sitting on a different bench. The Huskies band also played the national anthem pregame. It certainly wasn’t a road game though with a very pro UConn crowd of 9,204 with the Albany site a 2-hour drive from Connecticut. Samuelson has been dealing with a back injury since getting hurt against Houston in the final home game. She missed the entire American Athletic Conference Tournament. She struggled in the Sweet 16 victory over UCLA, scoring just six points and not hitting a basket until the fourth quarter. She was much better against Louisville despite being saddled with foul trouble. Her fifth 3-pointer of the game late in the third quarter gave UConn a 10-point lead. She soon after picked up her fourth foul and Louisville was able to cut its deficit to 57-53 heading into the final period. The Cardinals hung around and were only down 66-62 when Samuelson hit a 3-pointer. With 3:02 left, Samuelson hit another 3-pointer and was fouled. She missed the ensuing free throw, but it gave UConn a 72-63 lead. The Cardinals trailed by 11 with 1:47 left before the exciting finish. Durr saw her brilliant career come to an end as she scored 18 of her 21 points in the second half to lead the Cardinals. Samuelson got UConn going early. She hit a 3-pointer from the wing in the first quarter as UConn scored the first seven points of the game. Her back, which she injured late in the regular season, didn’t seem to be bothering her too much. Louisville bounced back with a 9-0 run to go up 16-12. The Huskies scored the final 10 points of the quarter to lead 22-16. Durr missed all eight of her shots from the field in the period, but did have five rebounds and three assists. The lead grew to 10 before Louisville made a run to get within four. The Huskies were up 41-34 at the half as Megan Walker had 12 of her 13 points, hitting four of UConn’s nine 3-pointers in the opening 20 minutes. UConn only hit eight 3s in the loss to Louisville in January. Posted in Newington Town Crier, UConn on Monday, 1 April 2019 20:48. Updated: Monday, 1 April 2019 20:50.